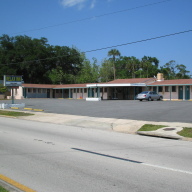 Relax Inn is a conviniently located motel that offers great services and clean rooms for the guest willing to enjoy their stay with-in budget. Distance to major attractions, restaurants, and recreation. Daytona Beach Board Walk that features Bungee Jump, Several Rides and Arcade. 30 - 40 minutes to Destination Daytona, Ponce Inlet Light House. Daytona State College, Bethune Cookman College, Mainland High School. Olive Garden, Romney "Upscale Japanese Restaurant", Maria Bonita, Subway, Taco Bell, McDonald's, Burger King, Whistle Junction, Arby's, Wendy, Sonic, etc. Volusia Mall, Super Wal-Mart, Sam's Club, K-Mart, Target, Best Buy, Publix, etc. And much, much more to see and do with-in and around this world famous town of Daytona Beach.